The recent CAE Medallion-6000 visual system upgrade to the Royal Air Force’s two C-130J dynamic mission simulators is helping the RAF to increase their use of synthetic training. On the eve of the International Training and Education Conference (ITEC), Europe's largest show for simulation and training, CAE and Lockheed Martin (NYSE: LMT) congratulate the Royal Air Force (RAF) on having operated its C-130J total training system for more than 15 years. The RAF was the launch customer for the C-130J Super Hercules, and the team of Lockheed Martin and CAE delivered the comprehensive aircrew and maintenance training system that entered service at RAF Lyneham in early 2000. Since its relocation to RAF Brize Norton, home of the RAF's transport and tanker aircraft fleets, the C-130J total training system continues to support the aircrews and technicians that fly and maintain the RAF's fleet of 24 C-130J aircraft. "The C-130J plays a vital tactical air transport role for the RAF, and this would not be possible without our highly-trained and skilled professionals who support our missions day in and day out," said Wing Commander Darryn 'Daz' Rawlins, Royal Air Force, OC XXIV Squadron, Fixed Wing Air Mobility, RAF Brize Norton. "Over the years we have increasingly leveraged our C-130J simulators and training devices for more of our overall training curriculum, and we expect this will continue through the life of our C-130J operations." Under the C-130J Hercules Integrated Operational Support (HIOS) program, Lockheed Martin has overall responsibility for supply chain management, which includes subcontracting the maintenance and support of the RAF's C-130J synthetic training equipment to CAE. The RAF C-130J total training system includes a suite of CAE-built synthetic training equipment, including: two C-130J dynamic mission simulators; one C-130J flight training device; one C-130J maintenance part-task trainer which includes a propulsion system, avionics system and auxiliary power unit; and one C-130J loadmaster fuselage trainer. Royal Air Force C-130J training at RAF Brize Norton also includes academic classroom training featuring self-paced and instructor-led computer-based training courseware. "Providing an integrated training solution that is concurrent with the aircraft supports the RAF in maximizing the tremendous value its fleet of C-130Js brings to a range of operational missions," said Jim Weitzel, Lockheed Martin's Vice President of Training Solutions. "Our industry team remains focused on helping ensure the RAF C-130J fleet and the UK armed forces service professionals supporting it are well-prepared and mission ready." In addition to providing contractor logistics support to maintain the RAF's C-130J synthetic training equipment, CAE has also recently performed major upgrades on several simulators. 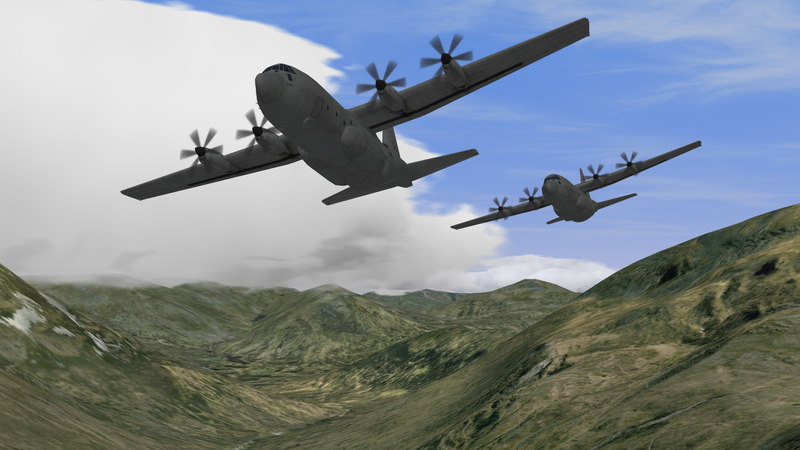 Within the past year, CAE upgraded the two C-130J dynamic mission simulators with the latest generation CAE Medallion-6000 image generator, and delivered a suite of databases built to the Common Database (CDB) standard to support rapid updates and enable distributed mission training. CAE also updated the C-130J flight training device to include a flat panel display and CAE Medallion-6000 visual system. "The new technologies and capabilities we've added to the suite of C-130J synthetic training equipment is now helping the RAF increase the use of simulation throughout its C-130J training curriculum," said Ian Bell, CAE's Vice President and Business Leader, Europe/Middle East/Africa. "We have been honoured to have played a key role in the development, delivery and support of the world's first C-130J training systems that have now supported the RAF for over 15 years."